On Sunday stitch school challenge last week’s heavy chain stitch was worked on folk design in red thread. This week’s stitch is interlaced running stitch. Expecting to start the sampler today. TAST challenge continues from today. This week’s stitch is magic chain or checkered chain. 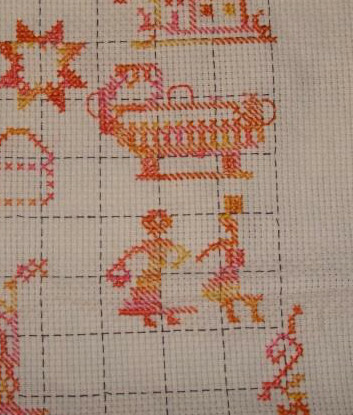 The link to the earlier worked sampler was posted on FB group page. No progress at all on RPW 2016 challenge. Another challenge for 2017 has started on their blog last week. Never ending sampler SAL is still in stage of browsing the other people’s work. Started with green threads on this piece. Some more progress has been made on the curves with a lighter green thread on the curves. 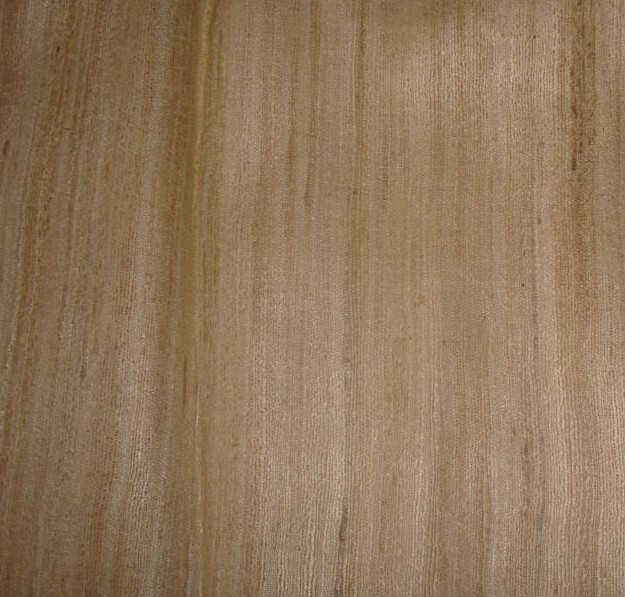 The picture will be taken after completing this treatment. Content with the progress on this project this week. It was slightly boring to work the chain stitches. Now working on stem stitch. If a change is required, a different project has to be worked, which will take time from this project. This was not touched this whole week, except for the taking a picture of the work left stand still. There is a fear that if this is not attended soon this will become an unfinished project. January 17th is the next date for the stitch of the week to be announced on newest TAST challenge. Four sided stitch was SSS stitch in December. This stitch sampler was completed this week. The latest stitch is gate stitch. Seems like a simple stitch and the samples could be worked on canvas. All my embroidery projects were not worked for some time. I am in a dilemma whether to embark on a new project [being new year and all that] or try tackling the neglected ones. To get over this , both options were tried. The kantha work on sleeves of this maroon and ikat tunic was restarted. This time it was anchor skein. Still working on the sleeve. Leaf stitches or fishbone stitches are started on the linen string bag. Anchor cotton skein in three colours are combined to create these leaves. Started chain stitches with gold metallic thread on this raw silk piece. This is a new project. Though it has been a busy week stitching wise, I am not able to decide on one project. May be, after starting on SSS sampler, this can be decided. After a weeklong vacation in Chennai, India, we went to Dubai for two days last week. Two full weeks of doing everything else but stitching. Meeting family, making plans, shopping… the list is endless. 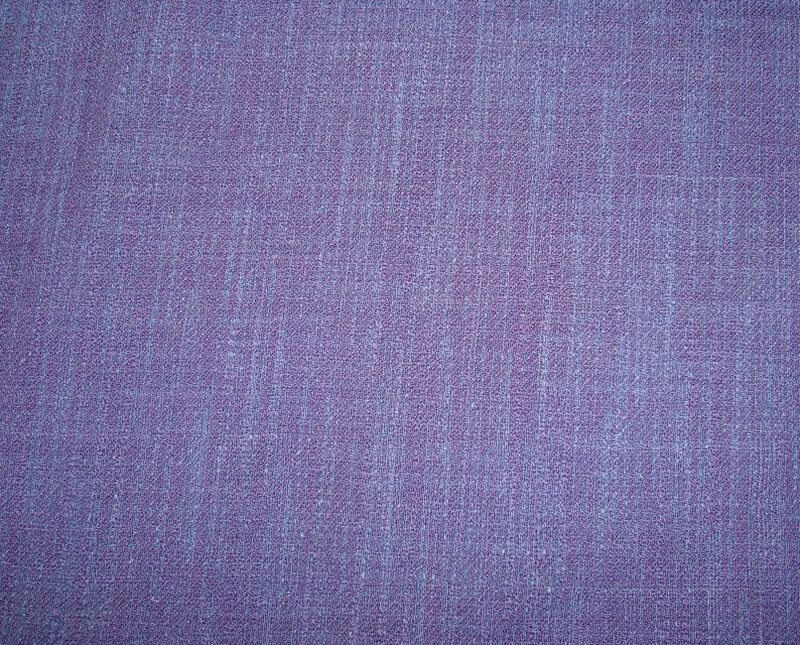 Some fabrics were bought, which will be shared on this category as and when they are designed. Now for the works in stand still. RPW 2016- Some motifs were started four weeks ago. The project is in the same position, though the challenge was completed officially on 31st December. Still a long way to go, hoping to take a picture of the progress this week! TAST Challenge is taking a break for two weeks. Sunday Stitch School- I am yet to start the latest- four sided stitch. Queenie who is conducting this challenge, was affected by Influenza, poor thing! Will feel happy if I can manage to start this stitch sampler tomorrow. This is a band sampler challenge started by Pamela Kellogg. The details are on her blog. I am still not sure about starting this challenge. But the cross stitch and black work bands are really interesting, and really want to see how the SAL members are treating these bands. Just read about it on Sharon’s Pintangle last week. This project was completed yesterday. The time slot between, coming back from India and leaving for Dubai, was solely used for this project. it is to be given to the tailor. I had this green banarasi brocade duppata for quite a long time. 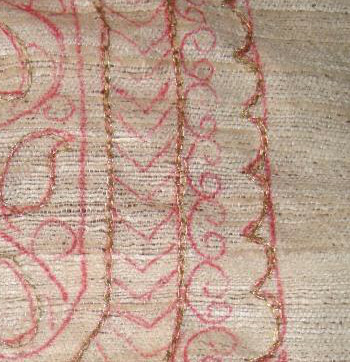 Few years ago, a tunic was designed and embroidered. But it didn’t look interesting after some time. 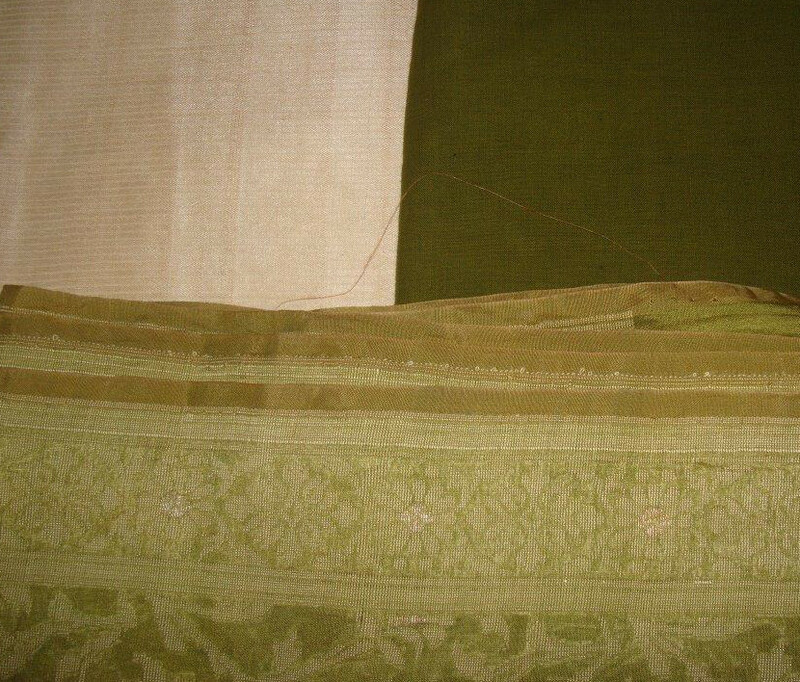 This time around, a cream silk fabric is chosen for the tunic and the dark green cotton fabric is for the salwar. 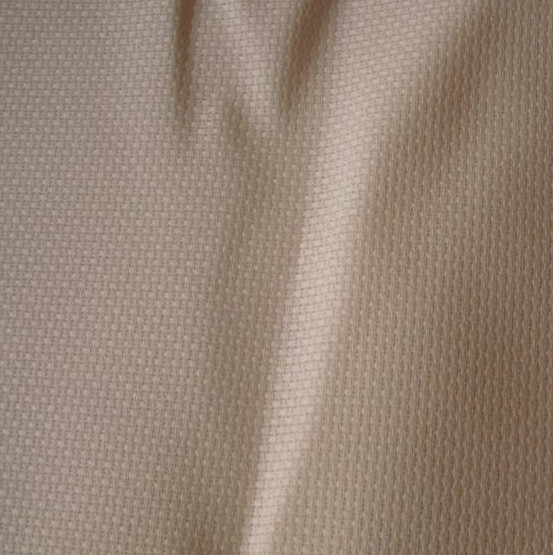 A simple pattern consisting of linear stitches is drawn on this raw silk fabric. 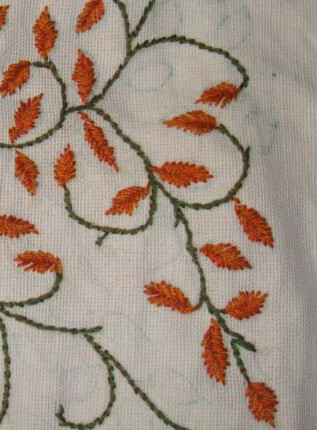 After working the stitches, the piece will also be embellished with green zardosi beads. I took this fabric with pattern drawn to India, in the hope of working on this project. But it came back intact in the box it was taken. This project was in mind for some months. I was shillyshallying between working cross stitch on aida cloth or on the fabric itself with waste canvas. There were many indecisive pattern choices. At last a pattern made up of two borders was selected. The decision is to work on 11 count Aida. The embroidery will be for the end of the sleeves. The tunic design will be decided later. The Aida on which these borders are to be worked.